Jomtien Condotel & Village. 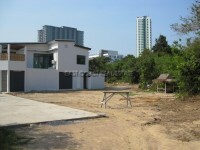 This 79 Wah² plot of land is located in a beach front housing and condominium estate in Jomtien. Currently there is a 3 bedroom bungalow with separate maid's quarter on the land plot that will need to be demolished or a full scale renovation is needed to bring it up to modern standards. The village has large internal roads, large communal swimming pool, tennis courts, children's playground, squash court, direct beach access and 24 hour security.